Zodi Outback Gear Extreme Shower without Stove, Stainless Steel by Zodi at Mountain Walk. MPN: 8140. Hurry! Limited time offer. Offer valid only while supplies last. The Industrial grade stainless steel construction and rugged hand pump operation of the Zodi Extreme Shower make your outdoor experience convenient. The Industrial grade stainless steel construction and rugged hand pump operation of the Zodi Extreme Shower make your outdoor experience convenient. Simply place the Extreme Shower on a sturdy and stable two burner stove and in minutes you have a comfortable and refreshing hot shower. 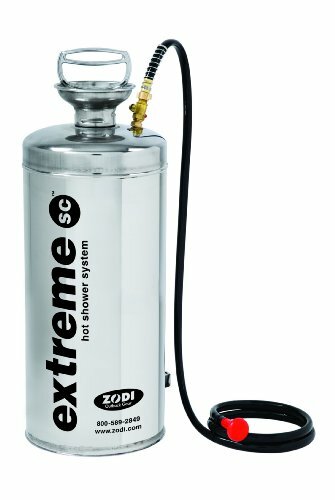 The Zodi Extreme Hot Shower includes a 6 ft. non-kinking shower hose, water-saving shower head, water temperature indicator and a shower pole holder for extra convenience (shower pole not included. ).